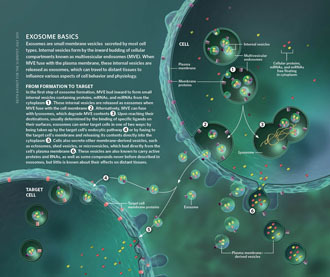 Exosomes (EXs) are cell-derived vesicles that mediate cell-cell communication and could serve as biomarkers. 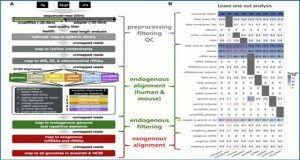 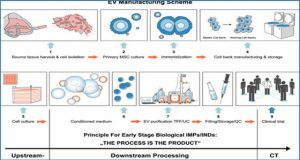 Here researchers from Wright State University described novel methods for purification and phenotyping of EXs released from endothelial cells (ECs) and endothelial progenitor cells (EPCs) by combining microbeads and fluorescence quantum dots (Q-dots®) techniques. 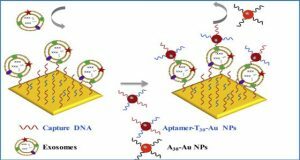 EXs from the culture medium of ECs and EPCs were isolated and detected with cell-specific antibody conjugated microbeads and second antibody conjugated Q-dots by using nanoparticle tracking analysis (NTA) system. 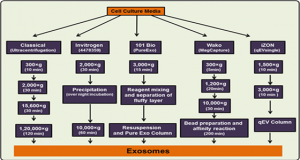 The sensitivities of the cell origin markers for ECs (CD105, CD144) and EPCs (CD34, KDR) were evaluated. 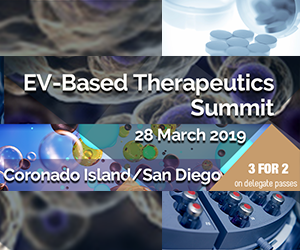 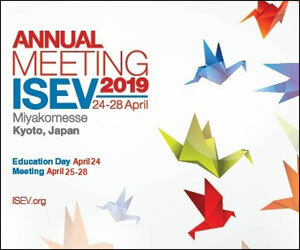 The sensitivity and specificity were determined by using positive and negative markers for EXs (CD63), platelets (CD41), erythrocytes (CD235a), and microvesicles (Annexin V). 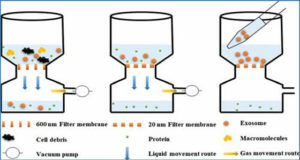 Moreover, the methods were further validated in particle-free plasma and patient samples. 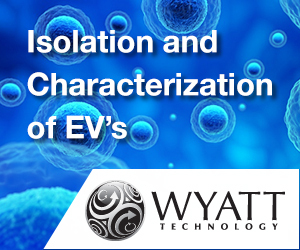 Results showed that anti-CD105/anti-CD144 and anti-CD34/anti-KDR had the highest sensitivity and specificity for isolating and detecting EC-EXs and EPC-EXs, respectively. 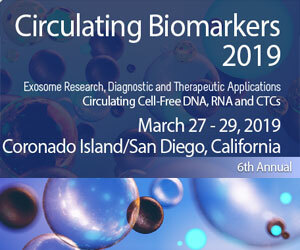 The methods had the overall recovery rate of over 70% and were able to detect the dynamical changes of circulating EC-EXs and EPC-EXs in acute ischemic stroke. 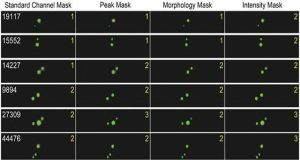 Representative NTA plots show size/concentration distribution of particles in the EX-depleted EC and EPC medium and of EC-EXs and EPC-EXs.